There are a couple of free applications that can be used to take screenshots on Windows mobile smartphones. However, most of them are not suited for latest touch screen mobile devices from HTC, Samsung and other manufactures. Windows mobile 6.5 compatible Whip2Snap is a useful program that does this job easily on high end devices. It works well with HTC HD2, HTC HD, Samsung Omnia and other accelerometer enabled Windows handsets. Whip2Snap will capture the screenshot of a Windows mobile smartphone, if the device is wagged to the right-left direction. For this we have to keep this application working in the background. 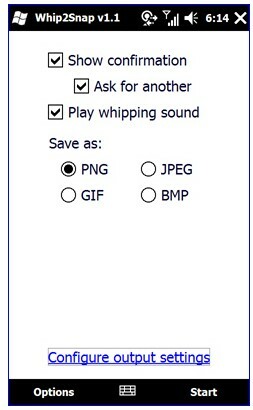 Whip2Snap supports common image formats, including JPG, PNG and GIF. It also includes an option to save screenshots to the storage card of the mobile device.